One of my ten Content Management Predictions for 2013 was that Facebook will hit rocky grounds in 2013 and that its growth will stall. Sure enough, just a couple of weeks ago, it has been widely reported that Facebook has recently lost the number of unique monthly visitors in the US. According to Nielsen, the number of unique visitors to Facebook’s website in the US has declined by 11 million - from 153 million to 142 million between March 2012 and March 2013. Another analyst firm, SocialBakers, appears to be confirming the trend by observing a similar decline in the UK. In addition, Gartner just published a report called How B2B Marketers Use Social Now which states that B2B marketers are abandoning their attempts to use Facebook as a way to connect with their audiences. I’m actually not a Facebook doomsayer. In fact, I am an avid user. These kinds of data points may very well just be a blip. A certain slowdown was inevitable, though, which is why I wrote my prediction. Facebook has been rising very, very quickly and the expectations were just too highly inflated. Some degree of disillusionment was inevitable. 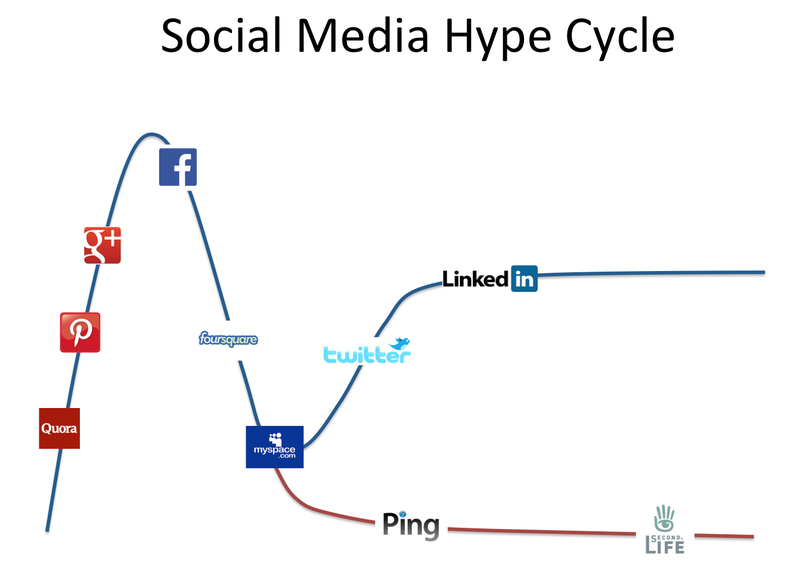 Connecting the recent Facebook data and my assessment of Facebook’s current situation with the Hype Cycle, I have mapped Facebook and other social networks onto the model. 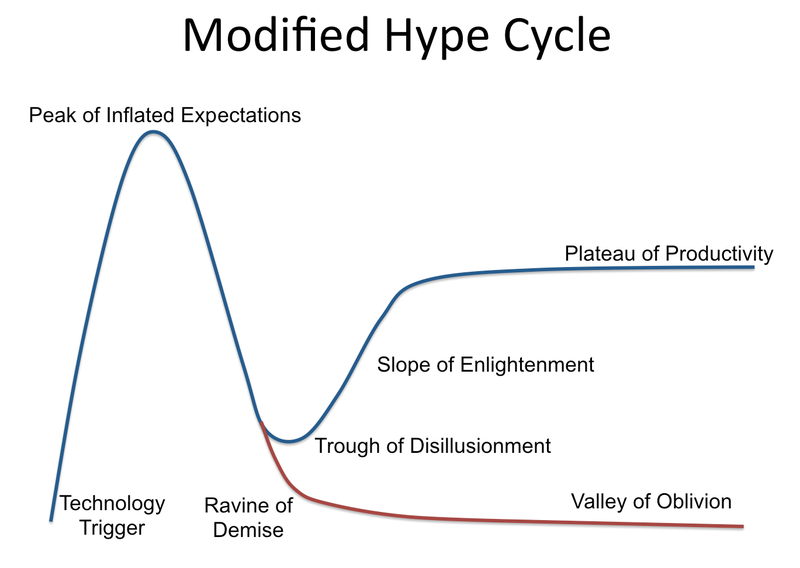 The Hype Cycle, though, has not been developed to examine specific products but rather technologies. To accommodate for that, I had to make a little modification, using the same poetic terminology that Gartner introduced. Because products do actually fail and disappear, I had to add another branch onto the chart. 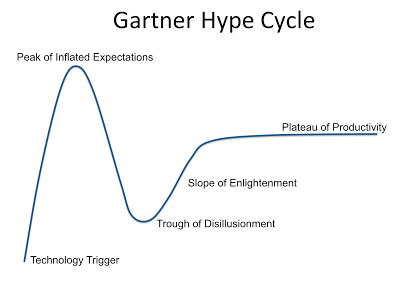 Come to think about it, technologies do fail too...perhaps Gartner should add my addition to their Hype Cycle model? Obviously, it takes some time for us to figure out what some of the social networks are good for. Sometimes, they fall victim to hype that anticipates more practical use cases or greater adoption than are realistic. An example of that is Facebook and its use for B2B marketing. That can sometimes lead to disappointment and loss of a particular audience or all of the audiences. On the other hand, after some experiments, we often do figure out the practical use and the social media tool becomes useful. Facebook has reached its peak of inflated expectations and that’s the reason behind some of the negative reports. Clearly, the service is hugely popular but it appears to have reached the limits of its usefulness. New innovations such as the Social Graph are mostly useful to advertisers rather than to the users and it is the danger of excessive advertising that is Facebook’s greatest threat. It is not clear today, what kinds of activities we will be using Facebook for in the future and there are many fashion trends on Facebook that keep coming and going - remember poking, gifting of virtual gifts, the Farmville craze, or the daily workout updates? Those have all come and gone. Perhaps that is the primary purpose of Facebook - to try things out on a massive scale and see what works in a highly connected, social environment. But before we have figured that out, there will be a decent dose of disillusionment along the way. Google+ has reached a critical mass of users but its audience is still limited. Chances are your family relatives are on Facebook and they are not on Google+. While you can have a very vibrant, special interest community on Google+, you can’t use Google+ alone because a good portion of your family, friends, coworkers, and acquaintances are not on it. At the same time, Google continues innovating with cool features such as the hangouts while they have the advertising bit figured out which is what most of Facebook’s innovation is being wasted on today. LinkedIn is clearly ahead of everyone else in terms of reaching the plateau of productivity. This is a social network for business, with a clear purpose and an obvious use case - recruiting. While your grandma might not be on LinkedIn, everybody in your business world has a LinkedIn profile, even those who are not on Facebook, Google+ or Twitter. Twitter has established itself as a productive tool in the business of quickly learning about what’s going on. We are no longer tweeting about what’s for dinner but rather about what we believe should matter to our followers. Whether it’s the recent political rally, the stock market swings, the latest corporate merger, or tonight’s sports scores, Twitter is really good for all of that. MySpace has evolved to a surprisingly resilient social network for the music scene and music fans. While MySpace clearly lost to Facebook the big war of general purpose social media, it may become a very viable special purpose social site. We’ll see which way it eventually goes. Quora has yet to find its purpose. The ability to ask questions and receive answers from a large community of similar minded people is powerful, but the practical use cases are limited. Market research would be the obvious suggestion but the heavy self-selection bias limits the usefulness of this social network. Foursquare is experiencing some disillusionment. While a few passionate users continue checking in and telling the world where they are - and in some cases that alone is somewhat interesting (yes, Mr. Steve Wozniak) - the practical benefits of that are rather limited. Basically, the only use case so far has been to better target advertising which is not what most people want more of. Foursquare is rapidly hitting the trough of disillusionment. Pinterest is quickly climbing up the slope towards the peak of inflated expectations. We haven’t quite figured out what is it good for but it is cool and addictive. A classic formula for a hype! 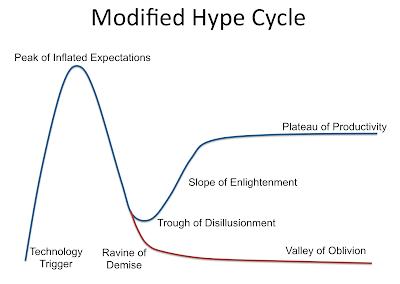 Inevitably, the trough of disillusionment will follow. Ping is quickly following SecondLife through the ravine of demise into the valley of oblivion. So there you have it. 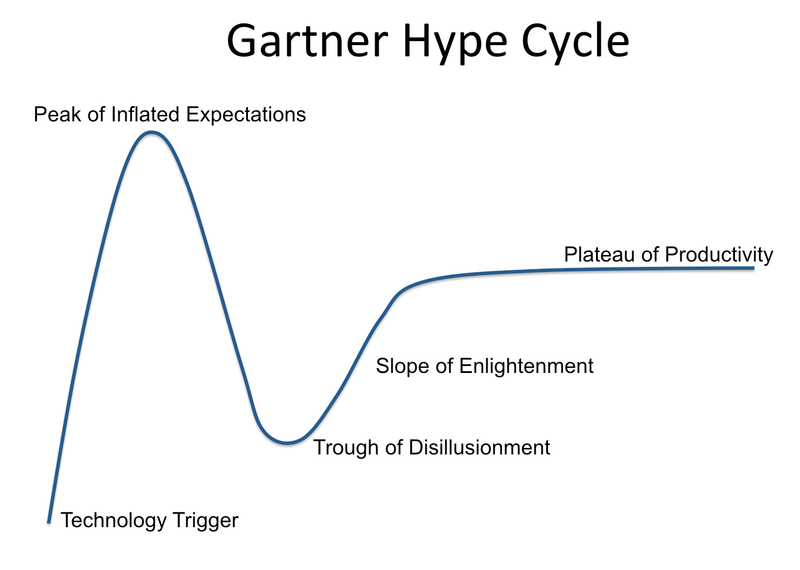 This is my way to analyze the state of Facebook and the entire social media market using the Gartner Hype Cycle model and some creative license. You may not agree with all my assessments but we will surely see a lot of fast-paced change in this space!